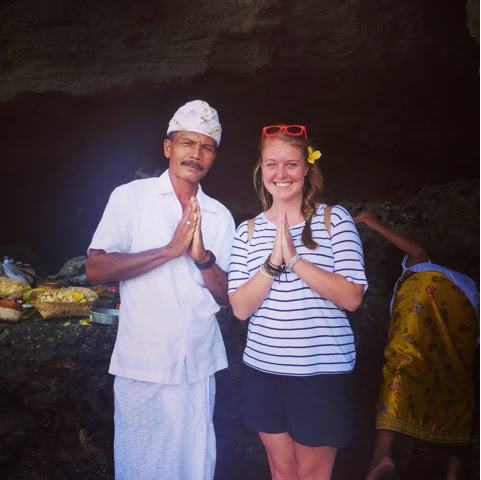 So I promised a second post on my Bali experience and this one is all about my Bali trip highlights! There was so many and Ive been looking forward to sharing them with you! Our first day in Bali called for a visit to the Monkey Forest. Since we were both uber excited about getting up close to some monkeys, and it was right on the doorstep of our hotel, we thought it'd been rude not to spend a couple of hours there. I'm so glad we went. The monkeys were adorable - although some not so friendly, you do need to remember they are wild animals and although they are surrounded by people all day everyday, they are not tame and not to be treated like pets. A couple of them showed us their teeth if we got too close - and not in a big grin kinda way neither. But mostly, they were friendly and the majority of the time they ignored us while we eagerly snapped away on our cameras, making squeaking mouth noises at them to get them to turn around, which only made them ignore us even more. Such tourists! 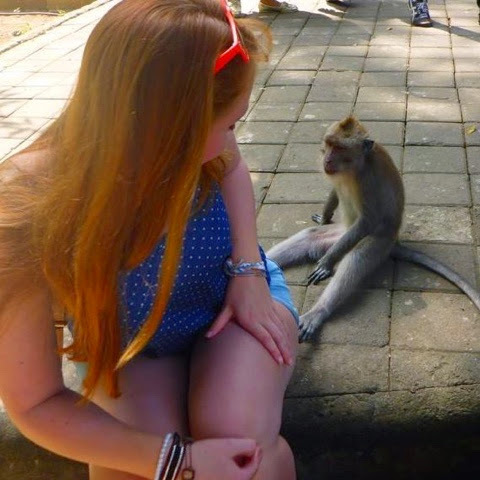 I found a little monkey just chilling out on a step, so I decided to sit down next to him and see if I could make a new friend. All was going great, until my new buddy wanted to have a peek inside my bag. This was moving much too fast for my liking, so I gently pushed him away. What happened next is the perfect example of trust betrayal. His tiny child like hands took my arm. I thought we were going in for a snuggle. We're best friends already! Next thing I knew his too-big-for-his-face chompers were around my arm! "What are you doing?!" I shrieked, pulling my arm away. And that's when our friendship broke up forever. Uh-huh. Sad times. 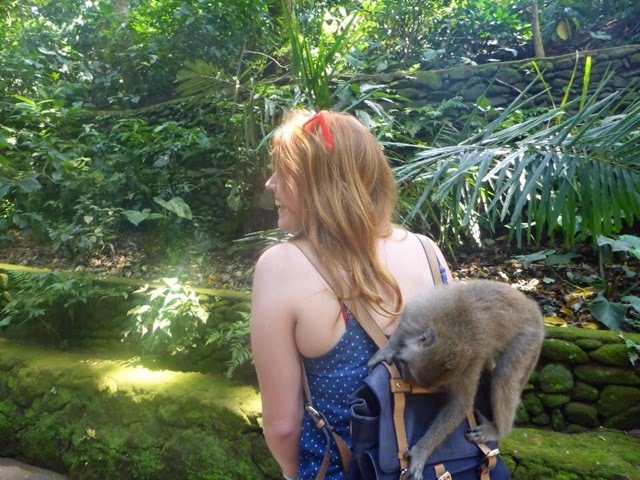 Near miss aside- me, my arm and my bag went on with our day and found more monkeys to play with - including this guy who tried a different approach to my ex BFF and tried to undo the buckles on my bag instead. Much to my amusement as you can see, but luckily there was a park ranger around before this guy tried to eat me for lunch. My next highlight had to be a bike tour that we embarked on. 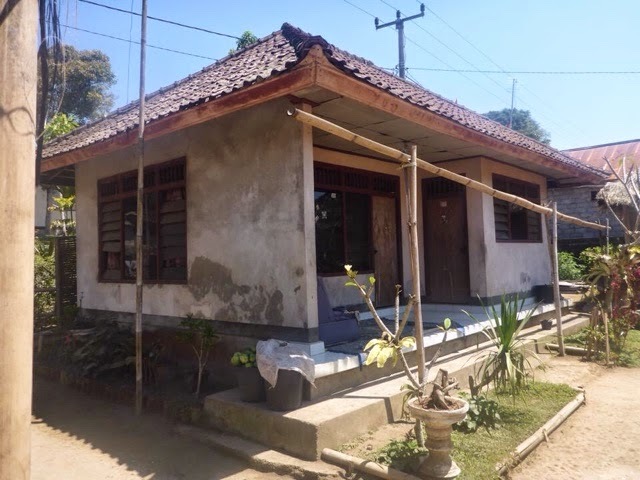 We got to visit a typical Balinese family home. The way these people live outside the touristic areas is such an eye opener. Please don't take your homes for granted folks - these people don't have the luxuries of a bath, a proper kitchen or a living room complete with flat screen and cinematic sound system. No, grandma sleeps in the kitchen, the rest of the family share one or two bedrooms and sleep on mattresses on the floor and they pretty much eat rice for every meal, every day. But these compounds as so safe, our guide told us he can leave his bike outside all night and it will still be there in the morning. And gossip is rife - no secret is kept a secret for very long! It was amazing to meet the Grandmother, who didn't know how old she was. The Balinese have more than one birthday a year, and longer years than we do. So it's almost impossible to keep track of your real age - which actually, I think is pretty cool! Very high up on the list of highlights and a memory I will cherish forever was meeting and riding Roxy at the Elephant Safari Lodge in Taro. I know how controversial elephant riding anywhere in the world can be, but I believe these beautiful animals are well looked after. The only problem I had was that they are chained at night, but I watched a guide attach an elephant to her chain while she ate her lunch (which looked pretty big and nutritious to me!) and she held up her foot for him. The chain wasn't a thick metal clasp that digs into the skin, it was loose and fitted just like a bracelet. The elephants looked so happy and I was delighted when Roxys trainer told us he came with her from Sumatra and they have been together for 10 years. Cute! Finally, we visited Tanah Lot on our last day which is a very beautiful temple. You need to visit at low tide to get up close, but I've also read that it's a beautiful thing to visit at sunset. Sadly we had to catch our flight so wasn't able to hang around long enough for sunset, but I did have time to get a blessing from the priest there. For a small donation you can take a drink from the freshwater well, considered to be holy water, a have rice placed on your forehead and a flower in your hair. Lovely! 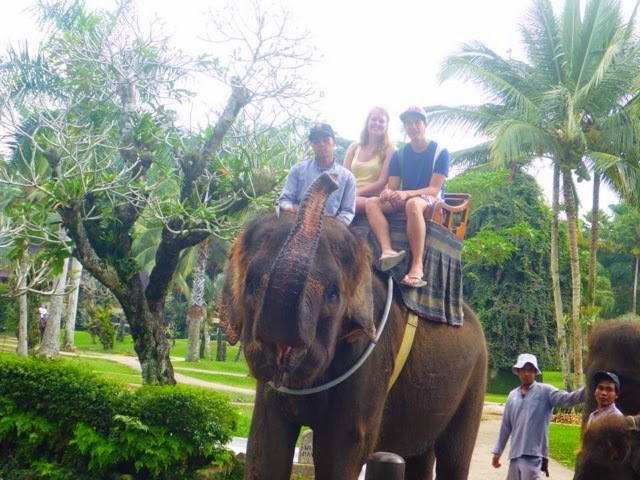 There were many, many more highlights of our trip, but these will be my fondest memories of our first trip to Bali.